It seems like a lifetime ago when Peter Wolf and the J. Geils Band were MTV poster boys, finally stars after over a decade of their signature R&B flavored rock. But it was the more commercial direction of the band that eventually led to its demise - Wolf was upset at the band for shying away from the soul music he loved in favor of songs like Centerfold and Freeze Frame, and in 1983 he left the group. The Geils Band released one more album, which flopped, while Wolf seemed destined for further success with his 1984 hits Lights Out and I Need You Tonight. Alas, that never happened, and even Wolf made some desperate attempts at pop not unlike those he scorned when he left his former group. 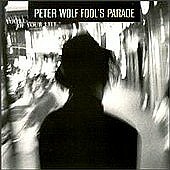 Fortunately for us, the Peter Wolf of the 90s has gone back to his passion for soul, and Fools Parade is the latest and best of his new incarnations. The album is timeless, only the production is contemporary. Peters voice has aged quite nicely - if anything, it sounds more natural. And of course, he isnt singing about his homeroom angels in girlie magazines anymore. If theres a common theme to these songs, its reflection - most evident in Cold Heart of the Stone, an elegy to Wolfs wild younger days in Boston, and Turnin Pages, a more general remembrance of things past. Cold Heart of the Stone is one of the most gripping singles of 1998 - musically resembling styles of Otis Redding, Tom Petty, and Wolfs own Geils Band, and honest lyrics like I remember the funky old place where we used to stay / we played all night and slept all day. Also notable is the bridge: Radio blast, full of the past / that can make you feel so alone, a clever, subtle homage to Lights Out, twisted just enough to be appropriate for him to sing 15 years later. But try hard as it may, even a song like that cant overshadow the other accomplishments of this disc. Turnin Pages is a Geils-esque sing along that would also make a great single. Roomful of Angels is the most 90s of the bunch, a mix of hip-hoppy funk and gospel. Id Rather Be Blind, Crippled and Crazy is first-rate cover of a 25-year-old tune that fits in very well. Even the love songs are just as gripping as the storytelling - Pleasing to Me offers some Aretha-ish duet vocals from Ada Dyer, and If You Wanna Be With Somebody is as sensual as any Prince record without the silly innuendo. Waiting On the Moon closes the disc with a stark, riveting ballad that features Wolfs harmonica and will send shivers down your spine. One may notice how easy it is to play spot-the-influence with these songs, but nowhere here can Peter Wolf be accused of being a plagiarist. Rather, he has chosen to incorporate new elements in his music as it evolves, and he has made some very classy choices. Fools Parade proves that a fifty-something rocker can be mature and reflective and still exciting, and that theres a very good reason some artists last through generations while others disappear after their 15 minutes of fame. Take that Matchbox 20 disc out of your carousel and stick in this fine collection from an old master who still has plenty to say.